Sunday: Gemini Moon void of course 5:39 am until 1:57 pm EST and then in Cancer. Full Moon warmup is here. Cancer Moon opposes Saturn in Capricorn and may relate to family issues or balance between responsibilities at home with family as opposed to in career or other outside roles. Black is today's color. Monday: Cancer Moon lends itself to creativity and the softer side of life generally. Inward, reflective approaches are favored. Jupiter aligns with the Moon opening us to emotions and abundance. Today's color is Blue. Tuesday: Cancer Moon void of course from 11:40 am to 1:53 pm EST. Leo Moon time follows. The Moon will be exactly Full at 8:27 am Wednesday with a Lunar Eclipse in Leo. This eclipse actually occurs in the Cancer constellation and is full of feminine nature and essence. Cancer is the sign of mothers, nurture and nourishment. Mercury in Capricorn opposes the Moon at 11:40 am. Many will be renegotiating parenting agreements with their coparent or with their children during this Full Moon. This may occur legally such as in mediation or interpersonally such as a family contract or agreement to be abided by. The Leo Moon aligns with Mars, active and ready to experiment and learn through experience. Today's color is Orange. Wednesday: During eclipse times things happen by surprise. By Full Moon lunar eclipse at 8:27 am EST you may be well into knowing of an unanticipated change or a significant move, departure, completion or closing. All of yesterday's forecast applies, plus Venus opposes the Leo Moon and both involve the heart. Hearts must be open to receive, to allow, to adjust, to feel and to heal. It's a process. Let your awareness be with your heart for both it's passions and it's pain. Relationships shift and commitments are called for or may be broken. All decisions made now have the air of 'permanence' so understand what you are agreeing to. Also, Mercury shifts to Aquarius at 8:29 am EST indicating a change of minds, mission and group energy. Observe, love, take your time. Today's color is White. Thursday: Void Moon in Leo 5:59 am to 2:13 pm EST and then in Virgo. This day might be best spent relaxing and socializing or gently sorting out personal matters. It feels like an 'in between time' with Mercury freshly in Aquarius and the Full Moon hanging over with all of it's effects. Stubborn squares to Jupiter in Scorpio and Mars in Sagittarius occur as the Moon moves between Leo and Virgo, one on each end of the day. Tread lightly. Notice what you may be hanging on to tightly, while knowing that must change. Today's color is Brown. Friday: Virgo Moon opposite Neptune and trine to Pluto. Notice subtleties and signs. You may begin to see a path or solve a problem. Avoid escapism, such as running from how you feel or from the truth. Indigo blue is today's color. Saturday: Void Moon 2:07 am to 4:47 pm EST. Relaxation favored. If you must work or study, immerse and give yourself time and privacy. Mercury aligns with Mars at 10:57 pm during Libra Moon time. This brings strong urges to get moving on projects and plans. A global, broad perspective and innovative ideas are favored. With Mars in Sagittarius we may take leaps of faith. Consider all alternatives first. Today's color is Light Blue. 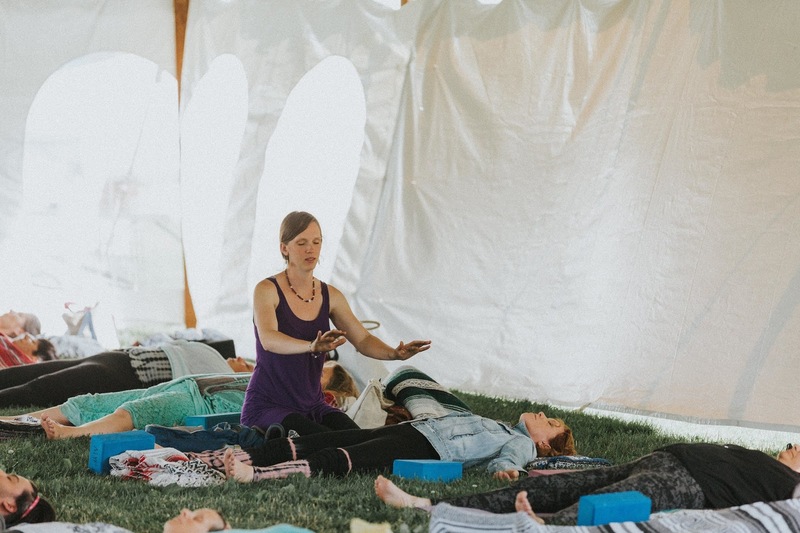 Saturday, February 24th receive the healing powers of Reiki by Addie Powers Johnson while you rest in very gentle, still Restorative Yoga postures, supported by bolsters, blankets, eye pillows and yoga blocks. Choices of Aromatherapy support your body and mind. You can opt in or out of any part of the practice as you let your body lead. Let us take care of you as eclipse season winds down. Addie is a gifted healer. 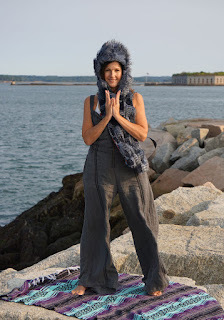 We look forward to offering you this practice again at Scarborough Yoga at 433 US Rte 1 Scarborough, Maine. You must sign up in advance, limit 14. There is still plenty of space. Restorative Yoga with Reiki and Aromatherapy sign up. Sunday: Pisces Moon void of course 8:13 pm to 1:27 am Monday. Pisces Moon and Jupiter in Scorpio form a healing and strongly intuitive trine. Emotions rule the day. Take care of yours. White is today's color. Monday: Aries Moon and a much different energy and flavor sets in. Reasons to be productive and act. Social and energized Monday. Red is today's color. Tuesday: Aries Moon with two squares and a curve ball thrown by Uranus conjunct the Moon. Put on your game face. Prepare plans B & C. Breathe through any madness today offers. Pause rather than act too soon. Void Moon begins 11:16 pm. Today's color is Black. Wednesday: Taurus Moon time begins 8:39 am EST after a potentially rough or misguided start. Slow down and take stock. Mercury conjunct Pluto intensifies what's on your mind. Problem solving and seeking helpful information is favored. Attempt logical, reasonable, rational thinking and actions. Yellow is today's color. Thursday: Taurus Moon. Mercury engaged with Jupiter is more positive and favors travel, learning, and even applying for higher education or opportunities. Taurus Moon for long term decisions. Void Moon 10:17 pm to Friday 12:40 pm EST. Get it done today. Green is today's color. Friday: Void Moon until 12:40 pm EST. Start slow, ease in, delay what's unclear in your mind. Mars to Sagittarius 7:56 am EST. Travel lust becomes stronger. Mars opposes the Gemini Moon that begins 12:40 pm EST. We're likely to feel more social and may hurry everything as the day/night progress. Check in with yourself frequently so nothing gets out of hand including your conversations or business dealings. Today's color is Light Blue. Saturday: Join me at The Eye of Henna in Portland, Maine for insights to the eclipses of January 31st and February 15th and how they influence your sign. Mary will offer henna tattoos for your sign! It's a wondrous event every time as like minded friends gather! Sign up through Mary at The Eye of Henna. Today, the Moon is in Gemini, friendly and outgoing. The challenge is not to be fooled or manipulated. Games and other events are nicely timed for attendance and entertainment. Today's color is Amber which is a mix of Orange and Gold. Gold will do. Join me on Sundays and Nicole on Mondays. 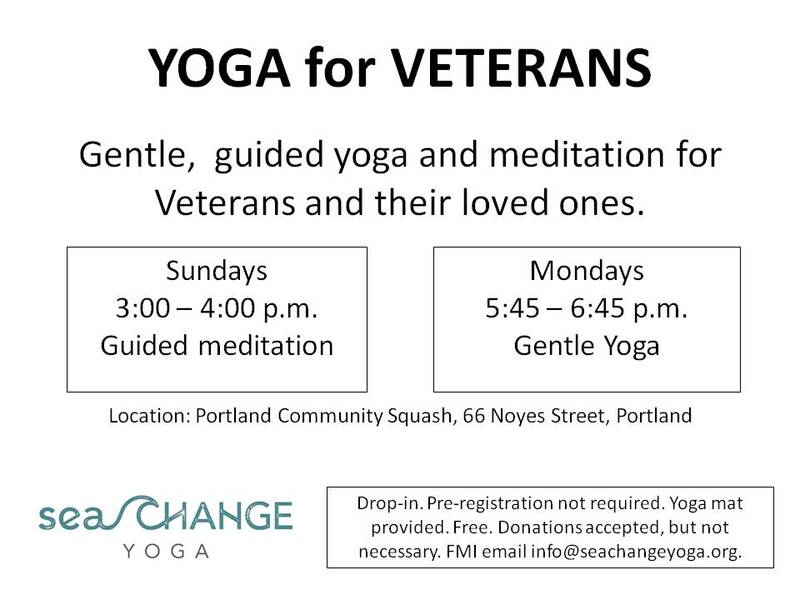 Veterans and loved ones welcome to attend together. Sunday: Sagittarius Moon void from 3:48 am to 2:42 pm EST. Those who wander are not necessarily lost, but some are. Feeling unsure or living with uncertainty is in today's forecast though some will be happily lost. Sun square Uranus can be a power struggle or sudden reason to step up and take charge. Capricorn Moon after 2:42 pm can help with grounding. Today's color is Brown. Monday: Capricorn Moon. Jupiter sextile Pluto. Philosophical, mystical, insightful and time to acknowledge deep fears or other feelings that have been on the back burner. Reflect (rather than act) as the New Moon time approaches. Black is today's color. Tuesday: New Moon in Capricorn 9:17 pm EST. Take time and care with thoughts, feelings and plans. Seek inspiration and ideas. New Moon is for setting intentions or resetting goals. White is today's color. Wednesday: Void Moon 1:30 to 3:32 am EST. Aquarius Moon time starts then. Venus also moves to Aquarius and spirits may lift. More promise, feelings of abundance and growth, connection with community and in personal relationships. We are in eclipse season now so you may notice big shifts in the making. Eclipses Jan. 31 & Feb 15th. Today's color is Light Blue. Thursday: Come together in friendship, community, and shared vision. Collaborations are favored. We'll stand strong in our beliefs and persevere in proving things. Aquarius Moon square Jupiter. Today's color is Blue. Friday: Aquarius to Pisces Moon. Void time is 6:52 am to 3:26 pm EST. Routine is important. Potential for aggravations is high. Simplify if possible. Delay what you're uncertain about. Be creatively imaginative. Stay out of denial or illusion where reality is important. 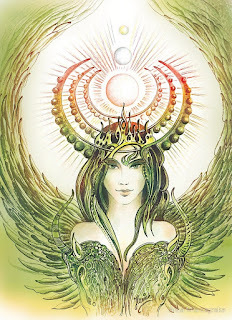 The Sun shifts to Aquarius for midwinter season. Light green is today's color. Saturday: Pisces Moon conjunction to Neptune is psychically stimulating. Pull out the tarot cards or consult a magical, intuitive friend. Meditation and quiet could be unusually satisfying. Pink is today's color. Restorative Yoga Teacher Training March 2nd-4th at Greener Postures W. Falmouth, Maine. 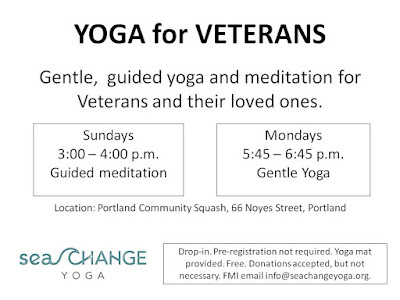 Yoga Nidra for Veterans starts Sunday, January 7th at 3-4 pm for 10 weeks. Spouses are welcome to attend. 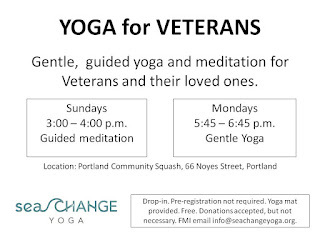 Come to Portland Community Squash at 66 Noyes Street Portland for this donation, pay what you can, meditation. Wear comfy clothes you can rest in for this completely guided, restorative meditation practice. Some of you visit RoZoYo.com for events and yoga schedule. My blog now has a new look, several workshops and yoga teacher trainings including Yoga Nidra Meditation Immersion and Restorative Yoga, and there's also an updated google calendar there. Perhaps add the blog to your favorites and check back from time to time at robinivy.blogspot.com. Sunday: Libra Moon starts at 7:15 am EST, and the Moon squares Saturn in Capricorn. Make a judgment call, get organized despite distractions. Today's color is Lavender. Monday: Libra Moon with challenging squares. Sun and Venus in Capricorn align with Jupiter in Scorpio. Healthy, productive decisions receive emotional support and resources from others. Today's color is Blue. Tuesday: Libra Moon void of course from 11:25 am until 3:05 pm EST. Sun meets Venus and Pluto (all 3 in conjunction) in Capricorn for practical and sensible relationship decisions and interactions. Relationships and partnerships are the focus today. Scorpio Moon begins 3:05 pm. Dark reds like Maroon are today's color. Wednesday: Scorpio Moon, passionate and strong willed. Sun aligns with Mars in Scorpio strengthening those same traits and adding structure. Protect your best interests. Create. Thursday: Mercury moves to Capricorn at 12:09 am EST. The Mercury in Sagittarius effect is over! Planning may be more effective in the days ahead. Scorpio Moon is void from 9:53 am EST on. Follow routines and take care of your body. Indigo Blue is today's color. Friday: Sagittarius Moon begins at 2:04 am EST and the Moon travels with no interaction or aspect to other planets today. You may feel free and clear. Honesty and learning opportunities are favored. Purple is today's color. Come to Willard Beach Studio in South Portland (Maine) to sample & learn more about doTERRA essential oils and the lunar cycle. 3:30-5 pm $20 www.willardbeachstudio.com and click workshops. Saturday: Sagittarius Moon. Mercury and Saturn meet in Capricorn. Serious and intentional, well thought out decisions and actions on this day. Relationships and responses from others are unpredictable as Venus squares Uranus. Do not let that affect your wise judgement. You are not on earth to please. Follow your instincts and inner wisdom. Today's color is Yellow.